Some Hamas figures have declared that the ceasefire negotiations have failed, while Prime Minister Benjamin Netanyahu said the cessation of rocket fire on Israel is a prerequisite for starting talks, but Palestinian sources who are familiar with Cairo's efforts to broker a truce said it was too soon to announce that the talks have collapsed. On Sunday senior Fatah official Nabil Sha'ath arrived in the Egyptian capital and met with Hamas politburo chief Khaled Mashaal. Sha'ath said Mashaal informed him that the negotiations have entered a serious stage but expressed doubt that an agreement would be reached anytime soon due to Israel's demands and its refusal to accept demands put forward by Hamas and the other Palestinian terror organizations. 1. A lull for a period of more than 15 years. 2. An immediate cessation of arms smuggling and the transfer of weapons to Gaza. 3. Cessation of rocket fire on the part of all armed Palestinian factions and an end to attacks on soldiers near the Gaza border. 4. Israel has the right to hunt down terrorists in the event of an attack or if it obtains information on an imminent attack. 5. The Rafah border crossing between Gaza and Egypt will remain open, but the crossings on the Gaza-Israel border will remain closed. 6. 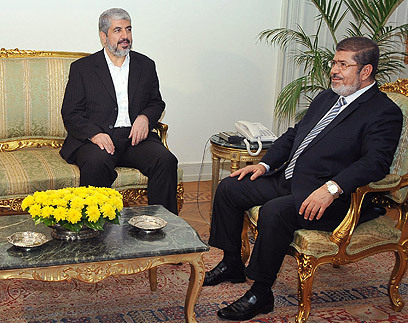 Egypt's politicians, headed by President Mohammed Morsi, will be the guarantors of any ceasefire agreement. Meaning, the agreement will be backed by Egypt's political echelon rather than by its security establishment. This list of demands has not been confirmed by any other source. Hamas' demands for a ceasefire include the lifting of the naval blockade of Gaza, international community guarantees for the cessation of targeted killings, an end to IDF cross-border raids and the cessation of attacks on fishermen off the coast. According to Sha'ath, Israel has withdrawn a key demand that Hamas lay down its arms and make certain that the rocket fire on Israel is stopped entirely. The Palestinian official said the negotiations have entered a "very important" phase. The Palestinian sources said Israel has threatened that if there is no response to its demands within the next 48 to 72 hours, it will launch a ground offensive accompanied by continued attacks on Gaza from the air and sea until the Hamas regime is overthrown. The IDF has completed its preparations for a possible invasion of Gaza. See all talkbacks "Palestinians: Israel demands 15-year lull, Morsi guarantee "